California State University, Northridge civil engineering students are inviting students at local elementary, middle and high schools to join them on Saturday, March 18, as they celebrate the life-changing structures created by engineers. CSUN Dreams Big event — which includes hands-on activities that offer insight into what engineers do and a special screening of the film “Dream Big: Engineering Wonders of the World” — was created to break through the hesitancy many people have about delving into the world of engineering, and invites young people, particularly women and people of color, to consider an engineering career. The event will begin at 4:30 p.m. at the Valley Performing Arts Center, located at the southern end of the campus at 18111 Nordhoff St. in Northridge. 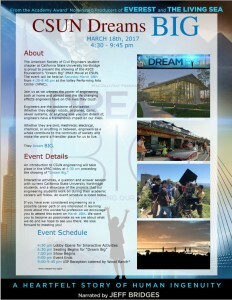 “To screen ‘Dream Big’ here — at the university campus that offers high-quality accredited programs in engineering and computer science, and truly serves the community that surrounds it — is a great opportunity to show young people that they, too, can make a difference through exciting careers in engineering,” Ramesh said. “It happens every day right here at CSUN. “The screening is especially meaningful for me since I represented IEEE — the Institute of Electrical and Electronics Engineers, one of the largest professional technical societies, with more than 400,000 members worldwide — along with the American Society of Civil Engineers (ASCE) and other societies in November 2015 at the National Academy of Engineering to create the hands-on activities to accompany the screening of the film,” he added. Created for the big screen, “Dream Big” explores the world’s greatest modern engineering marvels, from the Shanghai Tower in China to the world’s tallest suspension bridge in France. Viewers will have an opportunity to learn about basic engineering principles, the role of engineers in the overall design and build process, and how engineering is an interactive process of identifying problems and creating sustainable solutions. CSUN engineering students will be hosting a series of interactive activities beginning at 4:30 p.m. in the Valley Performing Arts Center’s lobby to underscore the film’s message about the value and accessibility of engineering. Among the activities is the construction of a 3-D model of a watershed and experiments to see how human and natural activities affect it, offering insight into water-resource engineering. Participants will get the chance to be structural engineers when they build a large-scale model of a cable-stayed bridge that is assembled like a real one, with bridge segments hanging from two towers. Those interested in environmental engineering can help design a process to treat water contaminated with acid and oil. To get a taste of geotechnical engineering, participants can build a mechanically stabilized earth wall out of construction paper to retain 500 pounds of earth. CSUN engineering students, who organized the event, also are taking part in a panel to talk about the film. The screening is expected to take place at 7 p.m.
Tickets for the screening are available through Ticketmaster and at the Valley Performing Arts Center Box Office. Use the coupon code “DREAMBIG2” on the Ticketmaster website to purchase tickets for $2 each.